I never imagined I would write a blog post about getting a fantastic three course meal in Epcot for under $25 per person. Yet here I am - writing about an amazing dining experience located in Epcot's France World Showcase. From the moment you check in at Les Chefs de France, you feel like you are in another country. The entire staff, from the servers to the hostess is good looking with a French accent. Bonjour. 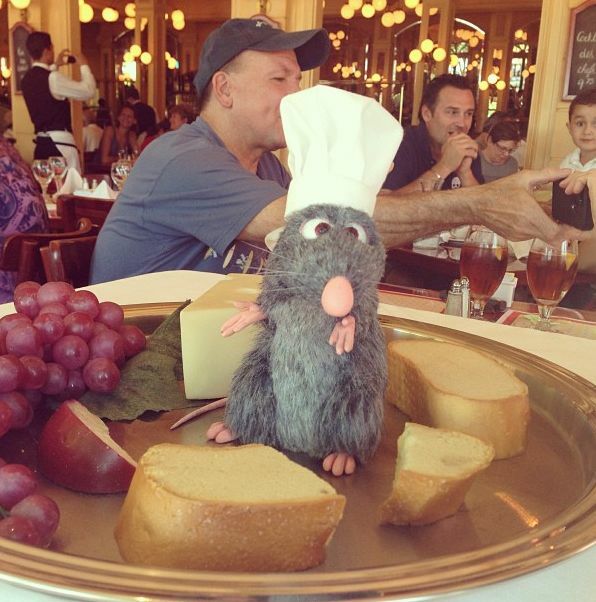 An added bonus to our dining experience was a special visit from Chef Remy, my favorite 4" chef out there. So adorable! For course one, I went with Bisque de Homard and it was one of the best Lobster Bisques I have ever consumed. It was my favorite part of the meal. My Mom ordered the Soupe a l' oignon gratinee and raved for 10+ minutes on how this was the most amazing French onion soup she has ever had. I know we will be visiting Chefs de France again in the future, at least for a cup of soup! For the main course, I ordered the Gratin de Macaroni which is not a dish I would generally order for lunch. While it was a heavy entree, it was delicious. It had the perfect amount of cheese and cream with amazing flavor. Mom went with one of my favorite French sandwiches - Croque monsieur. It was pretty amazing and I would order this again! For dessert - we ended up with the same dish, Creme Brulee. It was quite honestly the best Creme Brulee I have ever had. Beyond perfection. While I had an excellent meal at Epcot without breaking the bank, I felt the need to walk the park for an extra 5 miles. This was a very heavy lunch but well worth every calorie. We will be back again. Sounds yummy! I like that they have an affordable option for dining like that!